On July 31, Bvlgari held an extravagant event in Singapore. Prestige Indonesia was invited to the presentation of their new high-end jewellery collection: the Wild Pop collection. The collection was inspired by the iconic trends and historical moments in the 80s. Case in point, MTV debuted on cable television in 1981, which brought the greatest artists of the world: Madonna, David Bowie, Michael Jackson, Prince, Keith Haring, Jean Michel-basquiat, and Andy Warhol. During the 80s, Bvlgari was famous for their “Bvlgari” watch. It became a bestseller in the 80s and one of the first examples of logo jewelry. First created in the 40s, Tubogas also became extremely popular in the 1980s. Grace Jones was a fan, flashing her Bvlgari Tubogas jewels at late-night parties. It is a platinum necklace with a clear reinterpretation of an 80s jewelry silhouette. 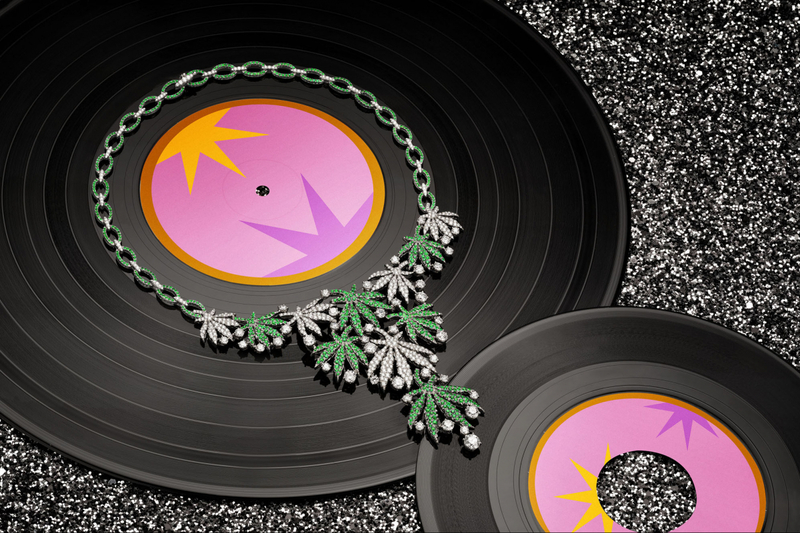 With its semi-rigid shapes and a stunning 24.80-carat sapphire combined with baguette diamonds, mint tourmalines and sapphires, this exceptional necklace epitomizes a “Pop” approach to High Jewelry. Daring, unexpected and unapologetic, it’s a synthesis of all of Bvlgari’s most prized design rules. The bracelet, earrings, and ring. Designed to evoke the majestic Manhattan skyline, these pieces were inspired by Bvlgari’s ongoing love affair with New York City, a relationship that was forged in the 80s. In a tribute to the striking skyscrapers of the city that never sleeps, the jewels are a graphic combination of black onyx and white diamond, finished with a marquise-cut diamond. The necklace is a showstopper! Set with an exquisite 34,12ct Colombian emerald, it was inspired by a piece of retro fashion advice courtesy of the Dynasty character Alexis Carrington, who said “When in doubt, add some ruffles to your dress.” Bvlgari took the advice to heart, creating one of the collection’s most stunning jewels. The brilliant bounty of nature has always been a touchstone for Bulgari, particularly the sparkling colors of the Mediterranean. In Feast of Flowers, the Maison honors the simple essence of a single flower, with a necklace set with 12 Zambia emeralds (45.15ct) and a stunning pair of earrings set with 2 pear-shaped Zambia emeralds (4.99ct and 5.21ct) mixed with rubies and diamonds. Its necklace, bracelet and ring in titanium and white gold are a glamorous tribute to the hot rollers women used in the ‘80s to create the iconic “big hair” looks that characterize the decade. “The higher, the wider, the curlier….the better!”, a fashion rule that Bvlgari immortalizes in brilliant diamond curls, topped by cabochon-cut emeralds. The yellow gold, carnelian, agate, and pavé-set diamond palms necklace take design cues from the look of Miami Vice. The theme song of the popular TV crime drama series opened with images of flamingoes, palms, blue skies and Art Deco buildings, reigniting the fashion world’s fascination with Miami, and catapulting its style on to international fashion magazines and runways. A special system of tiny hidden springs moves each of the 30 malachite hexagons covering the cuff. The diamond snake set atop the watch is set with diamonds in white gold and accented by rubellites. Distinctive microphones were the design reference for the colorful Pop Mics necklace, bracelet, and brooch. Amethysts, peridots, rubellites and aquamarines were specially cut to form the colorful top of the diamond and onyx microphones. Inspired by the recreational use of the herb, the jewellery is composed of white gold, 14.63 carats of pavé-set diamonds and over 5.60 carats of pavé-set emeralds. It’s an ironic, elegantly risqué way to depict the magical effects that enchanted an entire generation with dreams of escapism.